A simple and brilliant idea to be realized at school with clay slabs: colored tiles imprinted with different shapes of pasta. 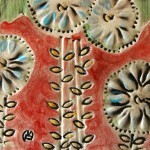 Farfalle, penne, fusilli or spaghetti become interesting tools to create texture on the smooth surface of the fresh clay. 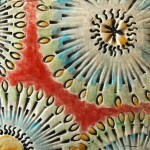 You can create abstract designs, patterns or small landscapes … giving space to the imagination. To color the tiles after the first firing I used the Engobes: I applied a layer of black over the entire surface and then I removed it with a damp sponge so that the black color have been left inside of the engraved marks. 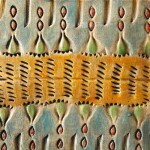 Then I colored the surface and then brushed the glaze transparent and eventually I proceeded with the second firing. These are brilliant! What a great idea! Can you make these without a firing oven? Just lovely, I will definitely be pinning this! You welcome Elizabeth! Thank you for your pinning! Thank you Vicki! I appreciated your comment! 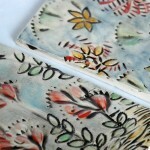 Thank you Mieke, I really enjoyed in making these tiles!! Love your creativity and would love to try with my elementary school kids. Any chance you could provide an simple “how to” design appropriate for little ones? Hi Nicole! Do you need simple drawings of the process? I can do it for your children if you tell me what do you need! let me know and I’ll prepare some drawings with every step for you. Wow! It’s very kind of you to offer Nicole simple drawings of the process to work with kids and if you wouldn’t mind sharing that with me I’d be very grateful as I am a newbie with clay. in case her project is different I’ll be making 2×2″ tiles and then have the kids stamp and decorate them. Thank you for the drawing tutorial, Miriam! Very very helpful. 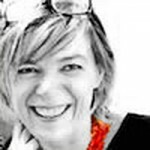 Great website and love your creative ideas. Was also wondering if decorating with an air dry clay onto a previously fired ceramic tile would adhere permanently with a glue? 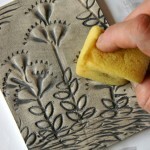 I think it could work, depend on the use that you do of the tiles, but if they are just decorative you can use glue. I have tried many of your lessons and LOVE your new website! I am crazy excited to try these pasta tiles! You rock! 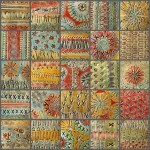 Thank you Dineen, If you’ll try to do the “pasta tiles”, please show me your work! I forgot to order the engobe (sp?) glazes but am going to because I see you are a big fan of it and i really like their look. I will definitely show you. Thank for your comment, I’m very proud of this project because it’s so simple!! I love this project! I would love to do this with my primary school students. I noticed you offered Nicole some drawings as to simplify it for younger students. Would you mind sending that my way as well? thanks for your comment, I’ll prepare the drawing for you and Nicole as soon as possible! Very cool! What is the thickness of the clay after rolling? Wow. What a terrific idea for stamping. 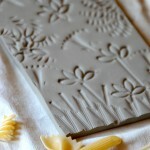 I’ve been doing clay for 40+ years and never, ever thought of using pasta for stamping. Did it this week with my students and they loved all the geometric and flower garden designs they could make. 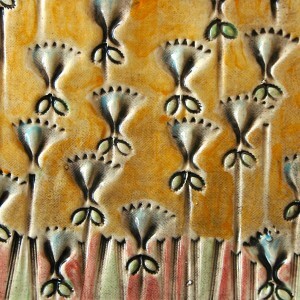 We all look forward to the firing and then adding engobe & underglazes! Thank you so much!! Hi Tina! 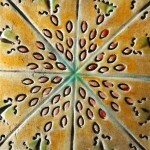 It is an honor to know a person with so much experience in matters of ceramic! I still have so many things to learn… I’m very glad to meet you on the web, perhaps you have got a web site where I could see your works! Thanks for your comment Tina, this was one of those ideas so simple that sometimes illuminate our work! great project, did you fire them with the pasta still in? Thanks! Hi Denise! The pasta is just for the imprinting in the fresh clay… I’m Italian and I know very well how cook pasta 😉 Thanks for your comment! so it all had to be picked out before firing? 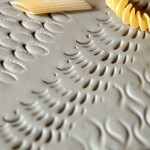 Yes, the pasta is used just to imprint the shape into the soft clay. 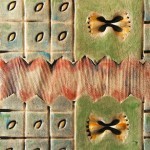 Then you wait that the clay is completely dry, and after that you can fire the tiles. 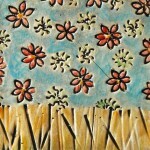 This is just the first fire, subsequently you decorate and glaze the tiles and they will be ready for the second fire. Have a look at evry picture of the gallery, if you have other questions, please contact me again! Hi Manu! I’m sure that they’ll enjoy this work! I’m curious to see your tiles! Hi Vandana! You can try, but the tiles will be too fragile without firing! You should try with synthetic clay (DAS Air Drying Modelling Clay) which will air harden. Do you know any product like this? brilliant!! Absolutely love it!! congratulations! 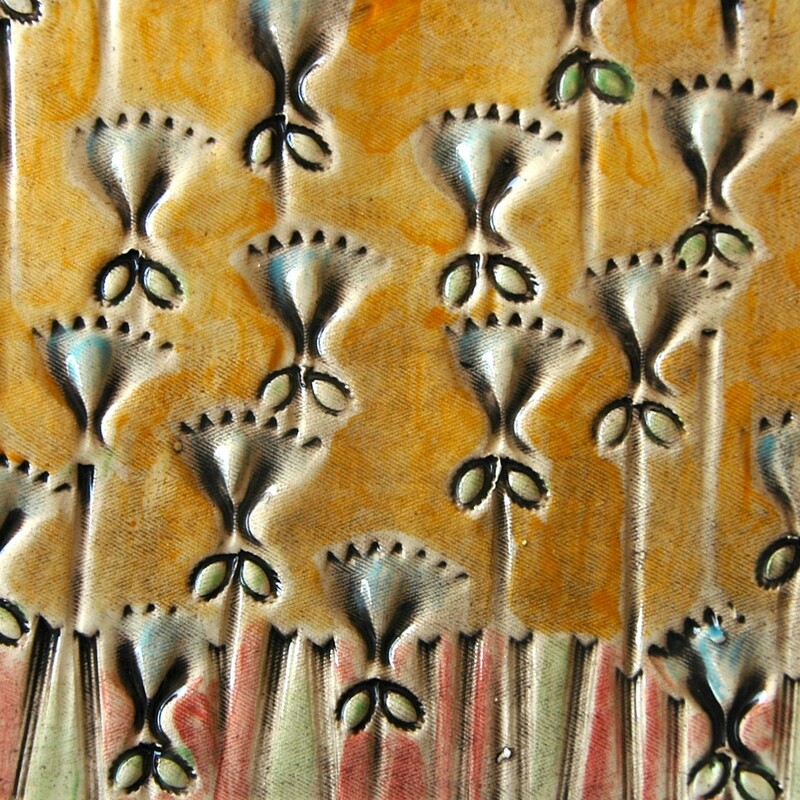 Would it be possible to do this project with air dry clay? Hi Heather, yes, I think would be possible to do it with air dry clay like Das, and you can color it with acrylic painting. If you try to do the project tell me how is the result! A great idea! They are beautiful, thank you! This is a fabulous idea as it stands. 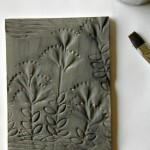 I am wondering if you think this technique could be used to create simple printing plates out of clay? Would they still have to fired? or could one ink the clay right away? Hi! 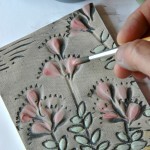 I think is possible to create printing plates out of clay. The only problem is that the raw clay is very fragile. Perhaps if the plates are small you can do it and even paint the surface. You have to try some sample. There is a soft material which hardens on contact with the air, is a sort of “artificial” clay created for school and children. You can mold it for some hours and then it become hard in a night. In Italy we call it DAS, but I don’t know if you can find it because is an italian product (where are you from?). It’ possible to paint it as well when is hard. Let me know if you find something similar or if you can do it with clay. Thank you for taking the time to answer my question. I am in the US. We do have a type of air dry clay like the one you suggested and I happened to have some on hand. Yay! I rolled it to 1/4″ (6mm), made my imprints and let it dry overnight. 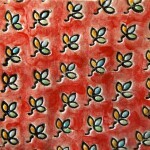 The resulting tile was somewhat fragile but produced a fabulous print if I gently used my hand to press the paper. I wouldn’t do this with a very young group but I think the older kids could do it fine. Thank you again for the inspiration! Did you make the clay homemade and do you have the how to do list ? I am an elementary art teacher and would love to try this. 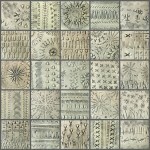 Terrific way to introduce concepts of pattern and texture with clay. What is engobe glaze? Is there something I could substitute? I have regular low fire glazes, underglazes and clear glaze. What works best for the black in the crevices? I also do an impressed leaf dish with fourth graders in the fall. This would be a great way to decorate and glaze these. Oh. Thank you very much. I can’t wait to try this! Thanks for your comment Gwen! 🙂 you’ll enjoy it! love these, thank you for posting. 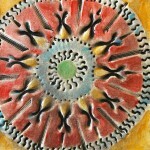 I also have sets of “watercolor” glazes; come in a watercolor style container with ovals of color. great idea!! love the colors! A question can it be done also with Fimo clay?? Hello. I was wondering how you use or make Engobes? Can something be substituted? I have glazes and underglazes and clear. 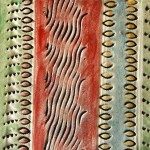 Secondly, when you added colour after the black sponge off, were those underglazes or glazes? Thanks! 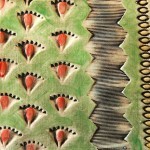 Hy what a beautifull work,what kind of clay did you use ? Hi Shawl, I think you can use your glaze, the effect could be different because the engobe is opaque and it needs a second fire with transparent glaze to become shiny, but at the end it will be similar.